This is a continuation in our series of MD Tech Tips — Technology tips to help physicians improve their craft and work more efficiently. MDCalc.com is one of the most popular medical websites for accessing calculators and algorithms that physicians use on a daily basis for patient care. They released the iPhone version of their app last year and we were fans, giving the app a rare 5 star rating. The evidence-based medicine (EBM) components of the medical app are what really set MDCalc apart from its peers. QXCalculate is prettier (in my opinion) and MedCalx has more calculators, but neither contains a similar amount of EBM content. 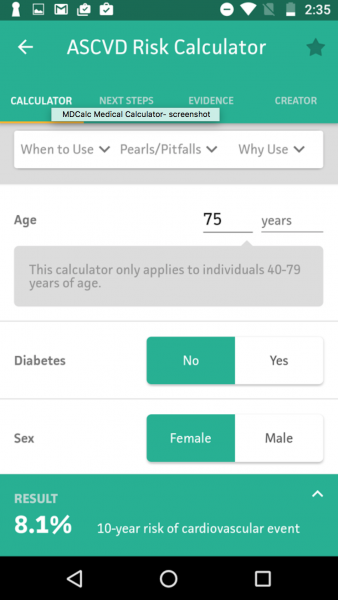 The MDCalc app gives brief summaries of the critical studies concerning the medical calculator, links to the studies on PubMed as well as “pearls/pitfall”, “next steps” and expert commentary from the authors of the calculators. Finally, the Android version has arrived. Why the wait? We see this often with physician centered medical apps since more than 80% of physicians are on iOS devices. Another recent example was one of our favorite fracture management apps, OrthoFlow — the creators took a similar amount of time to port their app over to Android. Needless to say, MDCalc will be a welcome addition to physicians who have Android devices.